You've got to understand what we do here...We fix weapons...Right now you're a broken guidance system for forty rifles, three machine guns, a bunch of mortars, several artillery batteries, three calibers of naval guns, and four kinds of attack aircraft. Our job is to get you fixed and back in action as fast as we can. 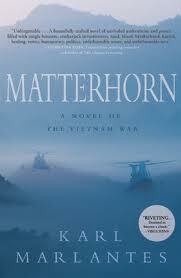 Matterhorn is a novel set in 1969, only a few years before the end of American military involvement in Vietnam. The book focuses on a group of Marines -- Bravo Company -- who fought in that war, but the action centers around Waino Mellas, a young Ivy Leaguer reservist who finds himself deployed with Bravo Company out in the bush. Mellas' story is a journey unto itself -- he is completely green when the novel begins, but as the missions of Bravo Company progress, he becomes transformed -- not so much by war itself, but by the people with whom he lives, eats, and comes to depend on for survival. And while the novel is fictional, what happens is based largely on many of the author's own experiences, or those of others he knew in Vietnam. In that sense, Marlantes adds his point of view to those of others who've written about Vietnam, such as Philip Caputo, Tim O'Brien, John Del Vecchio, and a host of others. However, unlike his predecessors, Marlantes had to wait several years to get his story out. His original novel was some 1600+ pages, but over the years after several rejections and continually whittling down the size of the book, his publisher finally gave him his opportunity. For this book, his first, the author won the Colby Award, which "recognizes a debut work of fiction or nonfiction that raises the public’s awareness of intelligence operations, military history, or international affairs." Matterhorn is a multi-faceted novel, but largely it is a novel based on conflict. Obviously, the Vietnam War itself fits that bill, but there are other forms of conflict at work as well on a human level. For example, in the ranks of Bravo Company there is contention between some of the enlisted men and their commanders, there are racial issues, there is a demarcation between new Marines and the more seasoned vets, and there are even collisions between those who make the Marines their career and those who are there for the short term. It's also a story of ambitions, especially among the colonels running the show, who care mostly about body counts and how the latest numbers are going to serve them well in their respective careers. Then there are the officers directly beneath them who spend part of their time thinking about the moves they should make to get in good with the upper echelon. For the war literature buff, there are also many horrific battle scenes along with the inherent blood, guts and gore and an almost Band of Brothers-type feel at times. But overall, it's a story about all of the people involved in carrying out the day-to-day operations of battle. The Matterhorn of the title is a mountain in the thick of the jungle, near the border of Vietnam and Laos, which Bravo Company is ordered to take and hold. They are then ordered to abandon it, then comes a reversal and the Marines are ordered to retake it, -- this last order coming while Matterhorn is controlled by a group of NVA forces who have plenty of time to keep the exhausted Marines pinned down under heavy fire. This novel is the story of those missions, along with a look at the men who are out there on the ground, not knowing if each minute could be their last. Each phase of these actions has heartbreaking consequences, as friends lose friends, or as the soldiers of Bravo Company find themselves cut off from being resupplied or without air support in bad weather. The novel traces how this slice of the war plays out, from HQ on down the chain of command to the officers who lead Bravo Company, and from them down to the regular field grunts who carry out the orders on the ground. Marlantes graphically depicts the physical terrors of war in the Quang Tri jungle, including leeches, tigers, stinging ants, "immersion foot," being bombarded with Agent Orange (a nuisance of the job) and other horrific details. He also doesn't hold back on describing the horrors inherent in any war: death, injury, and loss of friends and companions. The hill becomes a symbol of the utter futility of this war as human limits are pushed to extremes in an effort to survive. The men of Bravo Company, many of them in their late teens, must not only push past the ordeals of the jungle, but they also find themselves in the midst of some very human obstacles. For example, some of the black Marines are questioning the America to which they will return, showing sympathy with the Black Panthers and trying to recruit other black soldiers to their cause. Race issues rear their ugly head several times throughout the novel, once in particular with devastating consequences. Yet via his characters, Marlantes makes the point that even within the black soldiers there are conflicts -- that while some preach black power and react against the all-too-real prejudice of whites, there are other black Marines who don't want to support their tactics. Marlantes also pulls back the curtain on how war is played out through the chain of command, often detailing the upper echelon's misunderstanding of what's really taking place out in the jungle. In one instance, Marines on the ground are left hanging -- without food, water or ammo -- because of some of the decisions made by superiors back at their headquarters, whose understanding of the conditions in the bush is practically nil. They give the men impossible deadlines on fulfilling various parts of their missions, often based solely on how much ground they feel could be covered in a given amount of time, judged solely from their interpretations of a map. While Mellas is angered enough at one point to try to kill one of his COs, thinking that his dead comrades are nothing more to his superior than pawns in a game of ambition and politics, the author also makes the point that the higher-ups are also under a great deal of pressure -- and that in the end, everyone is involved in a situation over which they ultimately have zero control. There's very little sentimentality to be found in Matterhorn -- it is a gritty story about the realities and ugliness of war. The book is especially good at detailing the human toll of conflict, and I don't mean just the number of deaths or injuries sustained in this war. It is so well written that I literally could not put this book down until I had finished it, and that's no easy feat, considering it's well over 500 pages. I'm not a huge fan of war novels, especially the kind where the author gets into the nitty gritty of specific battle details, but this novel is different. The characters are real, portrayed without the author having to resort to stereotyping, and the key questions of this book are ones which I've been contemplating for some time. Why did we really get involved in Vietnam when it wasn't our war to fight? Was it worth losing so many lives? I very highly recommend this book. There are some negative reviews floating around, but use your own judgment. This isn't a book for everyone, and not everyone will read it in the same way -- it will mean different things to different people. Don't let the thickness of this novel deter you. It reads very quickly and you will find yourself sucked in from the first page. As a little girl around the age of eight yrs. old, I remember looking at my daddy and asking him if he was going to be in the war. Then at 18, I watched as classmates signed up or were drafted and found themselves in Vietnam. For many years, I ignored this part of our history and tucked it away hoping to forget the the intensity of emotion and the controversy surrounding the Vietname war. I just want to say, that finally after all these years I understand the enormous sacrifice that all these brave, young men went through.